The current retro revival shows no signs of abating. But then there’s no real reason why it should. The vintage aesthetic is a celebration of character and charm, as well as a nostalgic nod to past triumphs. Fujifilm has clearly taken this on board with its design process and come up with the stylish X series; a collection of retro-looking pro and enthusiast cameras, all with manual controls and built-in film-simulation effects. The latest model is the X30, the third generation of this family, and replaces the X20, released in February 2013. At first glance it seems to have the same innards as its predecessor, but we got our hands on one to find out exactly what advances Fujifilm has made. 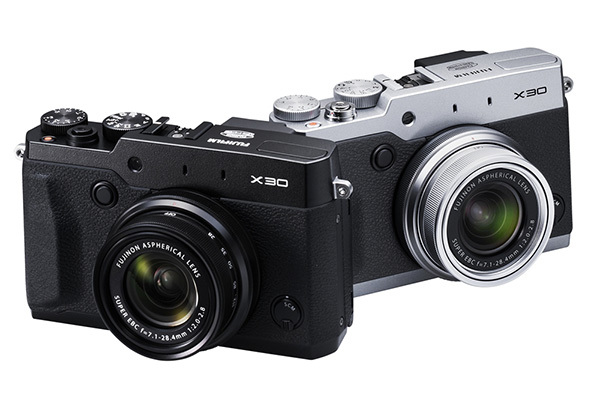 The X30 is bigger than the X20. Measuring 118.7mm x 71.6mm x 60.3mm, it’s 1.7mm longer, 2mm taller, and 3.5mm deeper. But there’s a reason for this: The X30 features a number of new space-demanding features. On the rear there’s a 3.0in, 920k-dot monitor, which can be tilted 45º down and upwards by 90º, to help you compose from challenging angles. The X20 had a traditional fixed screen. There’s also an Electronic Viewfinder (EVF) on the X30, replacing the optical one used by its predecessor. This is a 2.36m dot OLED viewfinder that offers 100% frame coverage. On the lens barrel there’s a new control ring, so rather than just twisting to zoom, there’s a secondary ring which can be used to adjust various settings. This gives quick and easy access to different functions depending on the shooting mode you’re using. The lens itself is a fast f/2-2.8 Fujinon 4x manual optical zoom. It offers the film equivalent of 28-112mm, making it a good all-purpose lens. It also has Optical Image Stabilisation which allows sharp shots at shutter speeds up to 3 stops slower than normal. The X30 isn’t just bigger, it lasts for longer, too. The new battery is capable of taking 470 shots per charge – 200 more than the X20. There’s also the welcome arrival of Wi-Fi on this release, meaning you can wirelessly transfer images to a smartphone or tablet to share them instantly with the world. You can also use an app to control the camera remotely. These new features bring this retro-looking camera firmly into modernity. The blend of old and new continues with the eight Fujifilm Film Simulation modes. These emulate film emulsions to give your pictures a vintage twist. There are also eight Advanced Filters, which will apply artistic effects like Toy Camera and Colour Pop. On paper, the sensor from the X30 is the same as that in the X20. It’s a 12Mp 2/3in X-Trans CMOS II chip, though Fuji asserts this sensor has been newly developed for the X30 and inherits its architecture from the top-spec X-T1 CSC, implying improved capability. Like before there’s no anti-alias filter, keeping pics as sharp as possible. The EXR Processor II appears to be the same as before, and offers the same impressive performance. The AF system is the fastest in its class, with a rapid focusing speed of just 0.06sec. The frame rate is nippy too, offering 12fps in its top burst mode, but these keen rates show no advance on the X20’s performance. Whether you think retro-looking cameras are wonderfully stylish and charming – or painfully anachronistic – the X30 offers a handling experience unlike most other compacts. The cool, smooth magnesium alloy body feels reassuring, while the leather-look textured grip gives a sturdy purchase. The Exposure Compensation and Mode dials rotate with a comforting click. To turn the camera on you need to twist and extend the lens, which feels like a call to action. The button layout is simple and ergonomic, and the Function buttons can be customised to control your most frequently accessed settings. The on-screen menu is intuitive and unfussy. New features like the EVF and tilt screen enhance the user-friendliness. There’s no noticeable lag in the viewfinder, and real-time exposure adjustments are displayed so you know exactly how your image will look. The large tilt-screen makes composing so much easier too, allowing you to get even more creative with your compositions. You don’t need to worry about the AF, either. It was fast and accurate, even in dim conditions. We took it to a fireworks display and shot in a variety of low-light situations, and every time the X30 delivered great results. The EXR II Processor was fast too. When set to shoot RAW files, the X30 limits itself to a brisk 9fps. It was capable of capturing 14 frames before the buffer filled, and these files took 5.1secs to be written to our 95MB/s PNY SDHC test card. Switching to its single shot setting, the X30 would write a RAW file in 0.8sec. When set to Large Fine JPEGs, it’s capable of shooting at a maximum of 12fps. We managed to take 19 images before shooting slowed, and these took 3.2secs to be saved. A single JPEG took just 0.7secs to write to the card. The X30 is priced at £479, but currently comes with a £50 cashback offer so could be yours for £429. This places it at the upper end of the compact market, but it does have the build and performance to match the price. For your outlay you get a beautifully-designed camera brimming with modern features, and a class-leading AF system. And when compared to its rivals, it’s certainly fairly priced. If you’d like to consider alternatives, the Olympus Stylus 1 comes in at £399 with a 12.8Mp sensor and a big 10.7x optical zoom. It also has a tilt-screen and a design that approaches the retro look. For a larger sensor, the Sony RX100 II offers 20.2Mp, a 3.6x optical zoom and a tilt screen. At £479 it’s similarly priced, but there’s no EVF included. For those seeking a stylish camera that’s perfectly capable of handling itself well in a variety of shooting situations – from straightforward to downright challenging – then the X30 could well be the compact to go for. If you own an X20, it’s not really worth upgrading to the X30 as the image quality and performance hasn’t moved on enough to justify the trade-up cost. That’s not to say that these aren’t impressive – it’s just that the X20 was already good in these areas. The lens is fantastic and delivers sharp, punchy results with no significant fringeing. The only thing that let down the image quality was the limited ISO offering in RAW mode, which is capped at 3200, and the amount of Noise at the higher ISO values. The camera has certainly advanced beyond the X20 in terms of its features, though – and with the X20 still available for £339, it’s worth paying the extra £90 (taking into account the current £50 cashback deal) for the added benefits of a tilt screen, EVF and other improvements. Also, if chic styling matters to you, then you’d be hard pressed to find a better looking compact. This review was first published in the January 2015 issue of Digital Photo - download back issues here.